Die erlaubten Lagerplatztypen sind in den Spalten LPTY0 bis LPT30 enthalten. REPORT Z_COLUMN_LOOP. data: ls_t334p type t334P, my_lptyp type lvs_lptyp value 'A1'. select * from t334p into ls_t334p where lgnum = '101' and letyp = 'E60'. if ls_t334p-lpty0 = my_lptyp or ls_t334p-lpty1 = my_lptyp or ls_t334p-lpty2 = my_lptyp or ls_t334p-lpty3 = my_lptyp or ls_t334p-lpty4 = my_lptyp or ls_t334p-lpty5 = my_lptyp or ls_t334p-lpty6 = my_lptyp or ls_t334p-lpty7 = my_lptyp or ls_t334p-lpty8 = my_lptyp or ls_t334p-lpty9 = my_lptyp or ls_t334p-lpt10 = my_lptyp or ls_t334p-lpt11 = my_lptyp or ls_t334p-lpt12 = my_lptyp or ls_t334p-lpt13 = my_lptyp or ls_t334p-lpt14 = my_lptyp or ls_t334p-lpt15 = my_lptyp or ls_t334p-lpt16 = my_lptyp or ls_t334p-lpt17 = my_lptyp or ls_t334p-lpt18 = my_lptyp or ls_t334p-lpt19 = my_lptyp or ls_t334p-lpt20 = my_lptyp or ls_t334p-lpt21 = my_lptyp or ls_t334p-lpt22 = my_lptyp or ls_t334p-lpt23 = my_lptyp or ls_t334p-lpt24 = my_lptyp or ls_t334p-lpt25 = my_lptyp or ls_t334p-lpt26 = my_lptyp or ls_t334p-lpt27 = my_lptyp or ls_t334p-lpt28 = my_lptyp or ls_t334p-lpt29 = my_lptyp . write: 'Platz A1 ist in Lagernummer 101 für Lagereinheit E60 erlaubt'. endif. endselect. my_lptyp type lvs_lptyp value 'A1'. write: 'Platz A1 ist in Lagernummer 101 für Lagereinheit E60 erlaubt'. Dies ist natürlich eine praktikable, aber keine zufriedenstellende Lösung. Erst recht nicht, wenn noch mehr Spalten geprüft werden müssen. Wie wäre es statt dessen, die Tabelle in eine neue Tabelle zu transponieren? Diese Tabelle kann dann mit einem einzigen READ TABLE gelesen werden um zu prüfen, ob die Kombination erlaubt ist. Hier kommt die dynamische Zuweisung von Feldsymbolen ins Spiel. Mit ihnen kann eine einzelne Komponente einer Struktur (hier eines Datensatzes) als Referenz verwendet werden. 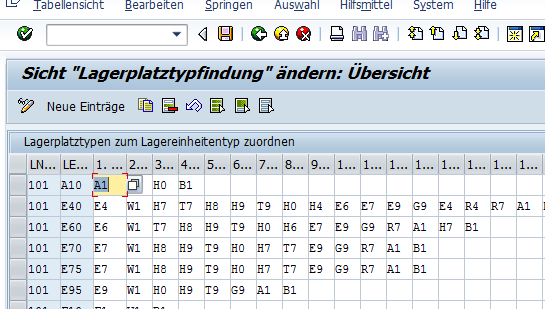 Zunächst habe ich eine Struktur für die Zieltabelle ty_t334p_advance erstellt und die notwendigen Variablen und Feldsymbole deklariert. REPORT z_column_loop. TYPES BEGIN OF ty_t334p_advance. TYPES: lgnum TYPE lgnum, letyp TYPE lvs_letyp, lptyp TYPE lvs_lptyp. TYPES END OF ty_t334p_advance. DATA: lt_t334p type STANDARD TABLE OF t334p, my_lptyp TYPE lvs_lptyp VALUE 'A1', lt_t334p_advance TYPE STANDARD TABLE OF ty_t334p_advance, lv_fieldname(20) TYPE c, lv_field_counter TYPE i VALUE 0, lv_field_counter_char(2) TYPE c. FIELD-SYMBOLS: <ls_t334p_advance> TYPE ty_t334p_advance, <ls_t334p> type t334p, <ls_lptyp> TYPE lvs_lptyp. SELECT * FROM t334p INTO table lt_t334p WHERE lgnum = '101' AND letyp = 'E60'. lv_field_counter = 0. loop at lt_t334p ASSIGNING <ls_t3349> DO 30 TIMES. lv_field_counter_char = lv_field_counter. IF strlen( lv_field_counter_char ) = 1. CONCATENATE 'LPTY' lv_field_counter_char INTO lv_fieldname. ELSE. CONCATENATE 'LPT' lv_field_counter_char INTO lv_fieldname. ENDIF. IF strlen( lv_field_counter_char ) = 1. CONCATENATE 'LPTY' lv_field_counter_char INTO lv_fieldname. CONCATENATE 'LPT' lv_field_counter_char INTO lv_fieldname. Nun erfolgt die dynamische Zuweisung der Strukturkomponente. Ist diese geglückt, wird eine neue Zeile in der Zielstruktur erstellt. Falls es nicht klappt oder die Spalte leer ist, wird die DO Schleife verlassen. ASSIGN COMPONENT lv_fieldname OF STRUCTURE <ls_t334p> TO <ls_lptyp>. IF <ls_lptyp> IS ASSIGNED AND <ls_lptyp> IS NOT INITIAL. APPEND INITIAL LINE TO lt_t334p_advance ASSIGNING <ls_t334p_advance>. <ls_t334p_advance>-lgnum = <ls_t334p>-lgnum. <ls_t334p_advance>-letyp = <ls_t334p>-letyp. <ls_t334p_advance>-lptyp = <ls_lptyp>. ELSE. EXIT. ENDIF. lv_field_counter = lv_field_counter + 1. ENDDO. endloop. ASSIGN COMPONENT lv_fieldname OF STRUCTURE <ls_t334p> TO <ls_lptyp>. AND <ls_lptyp> IS NOT INITIAL. APPEND INITIAL LINE TO lt_t334p_advance ASSIGNING <ls_t334p_advance>. lv_field_counter = lv_field_counter + 1. Nach dieser Vorarbeit kann leicht geprüft werden, ob ein bestimmter Wert bei dem vorgegebenen Schlüssel erlaubt ist. Beispielsweise ob im Lager mit der Nummer 101 die Lagereinheit vom Typ E60 auf dem Platztyp A1 abgestellt werden darf. READ TABLE lt_t334p_advance ASSIGNING <ls_t334p_advance> WITH KEY lgnum = '101' letyp = 'E60' lptyp = my_lptyp. IF sy-subrc = 0. WRITE: 'Platz A1 ist in Lagernummer 101 für Lagereinheit E60 erlaubt'. ENDIF. REPORT z_column_loop. TYPES BEGIN OF ty_t334p_advance. TYPES: lgnum TYPE lgnum, letyp TYPE lvs_letyp, lptyp TYPE lvs_lptyp. TYPES END OF ty_t334p_advance. DATA: lt_t334p type STANDARD TABLE OF t334p, my_lptyp TYPE lvs_lptyp VALUE 'A1', lt_t334p_advance TYPE STANDARD TABLE OF ty_t334p_advance, lv_fieldname(20) TYPE c, lv_field_counter TYPE i VALUE 0, lv_field_counter_char(2) TYPE c. FIELD-SYMBOLS: <ls_t334p_advance> TYPE ty_t334p_advance, <ls_t334p> type t334p, <ls_lptyp> TYPE lvs_lptyp. SELECT * FROM t334p INTO table lt_t334p WHERE lgnum = '101' AND letyp = 'E60'. lv_field_counter = 0. loop at lt_t334p ASSIGNING <ls_t334p>. DO 30 TIMES. lv_field_counter_char = lv_field_counter. IF strlen( lv_field_counter_char ) = 1. CONCATENATE 'LPTY' lv_field_counter_char INTO lv_fieldname. ELSE. CONCATENATE 'LPT' lv_field_counter_char INTO lv_fieldname. ENDIF. ASSIGN COMPONENT lv_fieldname OF STRUCTURE <ls_t334p> TO <ls_lptyp>. IF <ls_lptyp> IS ASSIGNED AND <ls_lptyp> IS NOT INITIAL. APPEND INITIAL LINE TO lt_t334p_advance ASSIGNING <ls_t334p_advance>. <ls_t334p_advance>-lgnum = <ls_t334p>-lgnum. <ls_t334p_advance>-letyp = <ls_t334p>-letyp. <ls_t334p_advance>-lptyp = <ls_lptyp>. ELSE. EXIT. ENDIF. lv_field_counter = lv_field_counter + 1. ENDDO. endloop. UNASSIGN <ls_t334p_advance>. 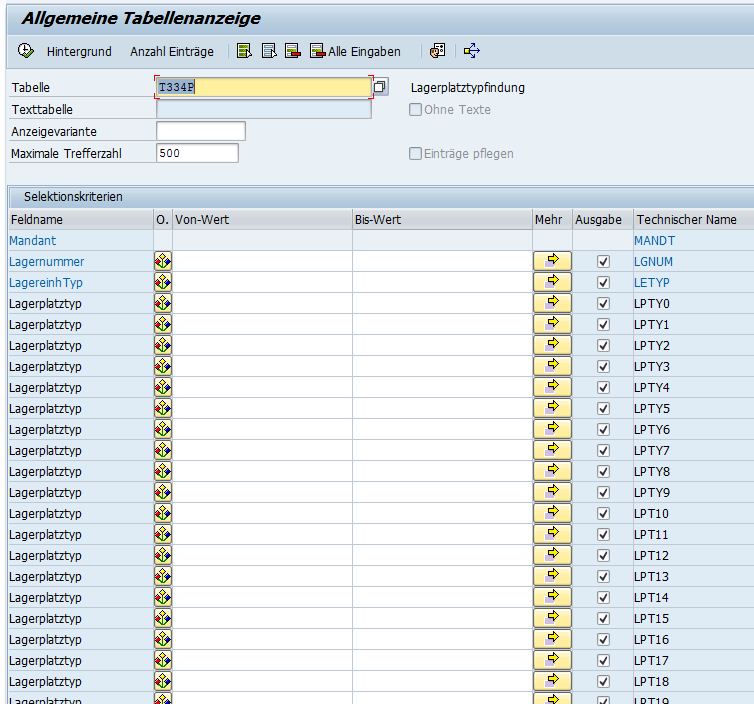 * Verwendung READ TABLE lt_t334p_advance ASSIGNING <ls_t334p_advance> WITH KEY lgnum = '101' letyp = 'E60' lptyp = my_lptyp. IF sy-subrc = 0. WRITE: 'Platz A1 ist in Lagernummer 101 für Lagereinheit E60 erlaubt'. ENDIF. loop at lt_t334p ASSIGNING <ls_t334p>.